It's important to interact with one's audience. With this in mind, I used to use the WordPress commenting system on my websites, but have since discovered something better. Interaction with one's audience is important. 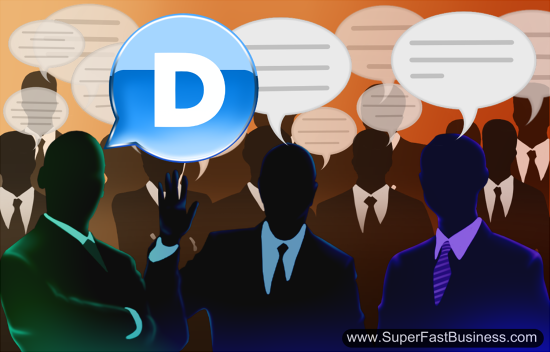 See why we choose Disqus for this purpose. 01:23 – What if you have multiple sites? Thing is, with Disqus, it still gets you all that SEO value. [Click To Tweet]. …it’s much, much easier to put a comment on the website. [Click To Tweet]. James Schramko here and you probably noticed, I’ve changed the commenting system on this website at SuperFastBusiness.com. I’m going to tell you what it is and why I changed it. So the new commenting system is called Disqus and that’s spelled with a q: D-I-S-Q-U-S, and I’ve changed to that from the WordPress commenting system and here’s why I did that. Firstly, I noticed it’s on a lot of other websites and that’s a good sign. And apparently, it’s on over two and a half million websites already. Thing is, with Disqus, it still gets you all that SEO value. All of the comments are search engine readable so that’s really good. And more importantly, it’s much, much easier to put a comment on the website. Now it lets you use the sign on with Facebook or other social media outlets so people can really easily leave a comment instead of having to log on and apply each time they want to put a comment. Also, at the end of the comments are related posts, bringing people into your website, plus it follows up with emails when someone makes a comment. So it pulls the reader back into the new comments to see what’s there. And the way that the comments are displayed is really nice with that nested thing where you can reply to someone’s reply. Plus users can vote up or down. It works really well on mobile devices and it has an RSS feed for people who want to follow just the comments on a particular blog post. And as a person with multiple websites, I’m finding it nice and easy to have a central moderation where I can keep up to date with what’s happening with all of my websites from just one place and I can even keep in tune with the comments I’ve left on other people’s websites in the Disqus community. So I’m a big fan of the Disqus. It’s very easy to install. You can migrate your old comments. It works really well with WordPress and plenty of other platforms and that’s what I’m using from now. So what I’d like you to do is use it for yourself. Right below this video, place a comment, see how it works, tell me what your thoughts are and if you like the new Disqus feature that I’ve put on SuperFastBusiness.com. I’m James Schramko. I’ll catch up with you in a future video. This’ll be my first comment using Disqus, hi future self looking back at the start of the blockchain revolution! Great video by the way, and thanks for sharing your knowledge. would you say it’s still relevant (5 years later) or is there something better? Samson I still use Disqus and the main trend is that there are less comments on Blogs in general. Many bloggers turned off comments and drive discussions on Facebook. Next we might see people starting to leave Facebook. I’m happy fielding high quality comments here.